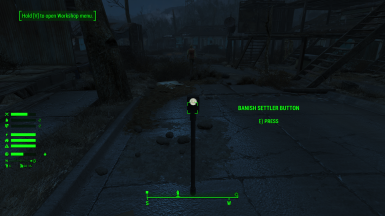 Put the "Black Spot" in the inventory of the settler and press "Banish Settler Button". The settler will disappear. For better sorting, the name "Black Spot" is replaced by "(*) Black Spot"
The Banish Settler Button can be found in the Special category of workshop menu. Black Spot can be crafted at the cooking station in the UTILITY category. Uses a vanilla mechanism of unassigning settler from workshop. red button - settlers with Black Spot not found or it's Marcy, Preston, etc. green button - banish in progress, wait for it to turn grey. The correct removal from workshop takes time. Be patient.